Make the crazy days of December better for everyone. Need a way to keep morale up and staff energized this month? 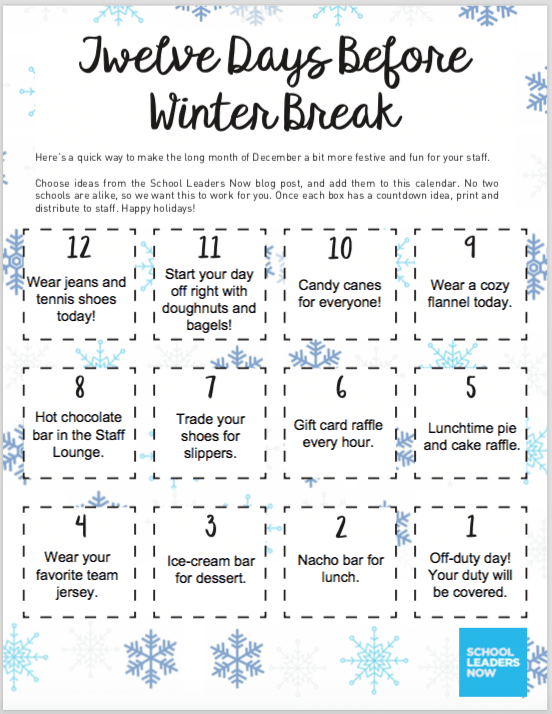 We have you covered with this Staff Countdown to Holiday Break! Tons of talented administrators and school leaders have been sharing the ways they use a countdown-type of activity each year in the busy month of December. With the many emotions associated with the holidays and anticipation of days off of school, this time of the year can be super challenging for students and teachers alike. The idea for the countdown to holiday break is super simple and can be done in a number of ways. Ultimately, this is a way to have staff look forward to each day of the month, each day they come to school. Either the staff is given a small treat each day, or there’s a challenge to complete each day. Some schools ask that staff turn in their countdown sheet on the last day before break in order to be put into a drawing for bigger, more exciting prizes. No matter how it’s done, the administrators in our group tell us that doing something like this for their hardworking staff brings them great joy. Lord’s a Leaping, It’s Lunch! Talk about some serious time and creativity here, right? Way to go, Michelle! Thank you to Andrea and Michelle and the many other administrators in our group who shared their experiences with us! And we want all the awesome administrators and school leaders out there to be able to do something similar for their staff. However, we know that time is hard to find at this time of the year. That’s why we made this super easy-to-personalize “Countdown to Holiday Break” calendar for you. You can choose whatever ideas make sense for you and for your staff and then add them to your calendar. 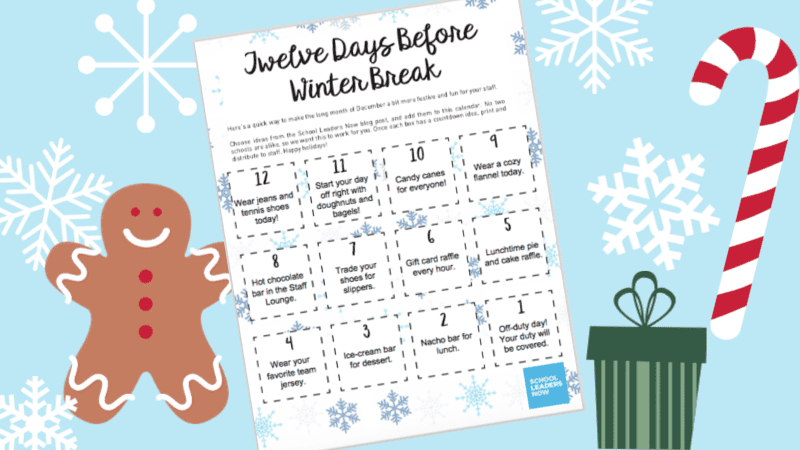 Our printable Countdown to Winter Break Calendar is editable, so you can make it your own. Here are just a few of our 12 Days Before Winter Break Ideas. Wear jeans and tennis shoes today! Eat lunch in the Staff Room but make sure there’s no talking about school! Start your day off right with doughnuts and bagels! Wear a cozy flannel today. Off-duty day! Your duty will be covered. Class coverage — you will get a surprise 30-minute break today! Book and magazine swap. Bring some reads to share and grab something new. Island dreamin’ — wear your favorite tropical attire. 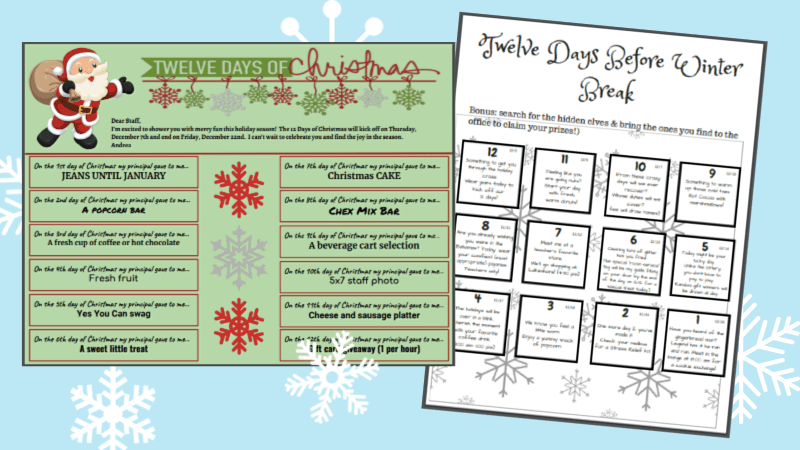 Grab the printable Countdown to Holiday Break Calendar here. Do tell us what other ideas you’d add to this list—we’d love to know! Share your ideas in the Principal Life Facebook Group. Amy Mascott is Senior Digital Editor and Creative Manager for WeAreTeachers.